The NZ Volvo CE Operators Club is an exclusive club which is intended for all operators of Volvo construction machinery in New Zealand. Members will receive a FREE Operators Club baseball cap, travel mug and key ring upon joining. If you have a membership card, the reverse of the card displays a unique code to enter into the application form on this page. If you do not have a card please just leave this blank and we will issue you a membership card and number upon receipt of your application. 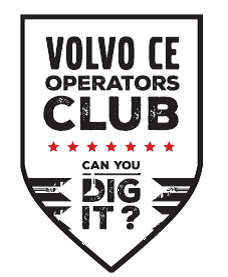 You will also be able to join The Volvo CE NZ Operators Club Facebook group where will then be able to share updates, photos and videos with other Operators Club members. TransDiesel reserve the right to refuse membership at their discretion. All members will be issued with a welcome gift pack. All members will enjoy exclusive promotions, offers and competitions with great prizes. Membership is free! To join simply fill in the form on this page. All applicants must be aged 18 years or over and resident in NZ. It is our policy to take all necessary steps to ensure that personal information contained in this form is processed fairly and lawfully in accordance with the Data Protection Act. By becoming a member of the Operators club you agree to receive information by e-mail about products and the latest offers from TransDiesel / Volvo Construction Equipment until such time in the future when you may choose to unsubscribe from the service or inform us in writing that you no longer wish to receive email marketing. The Operators Club is not open to employees of TransDiesel or Volvo CE. Membership of the Volvo CE Operators ClubNZ is subject to you agreeing to these terms and conditions.